This blog is dedicated to all engineers (and not only) that are using software solutions in their civil enginneering projects. 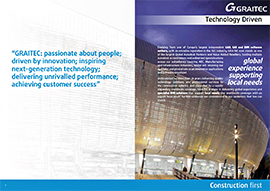 GRAITEC is a major software developer committed to providing a highly professional complete CAD and Analysis solution dedicated to Structural Engineering and Construction, able to offer a complete suite of fully compatible and integrated state-of-the-art products, covering design and detailing for the reinforced concrete and steel construction industries. i’m keen to see your posts. good luck!